One of the core goals of plant conservation is to ensure that vulnerable species are protected for future generations. That our children face the possibility of not knowing the full breadth of our planet’s biodiversity is very troubling. Among the multitude of plant species in danger of disappearing without many people ever being aware of their existence is American hart’s tongue fern (Asplenium scolopendrium var. americanum). This distinctive evergreen fern has glossy, undivided fronds said to look like deer’s tongues. A different variety of the species is common in Europe, but the American variety evolved along the Niagara Escarpment and has adapted to living in crevices in the magnesium-rich limestone substrate common there. Ninety percent of the U.S. population is found in New York State, mostly in the Adirondacks. Literally rooted in place, this rare plant is vulnerable to the intense pressures of habitat loss, nonnative species, and climate change. However, its death knell has yet to ring, thanks to the scientists, ecologists, and horticulturists who have been working to protect it for almost a century. 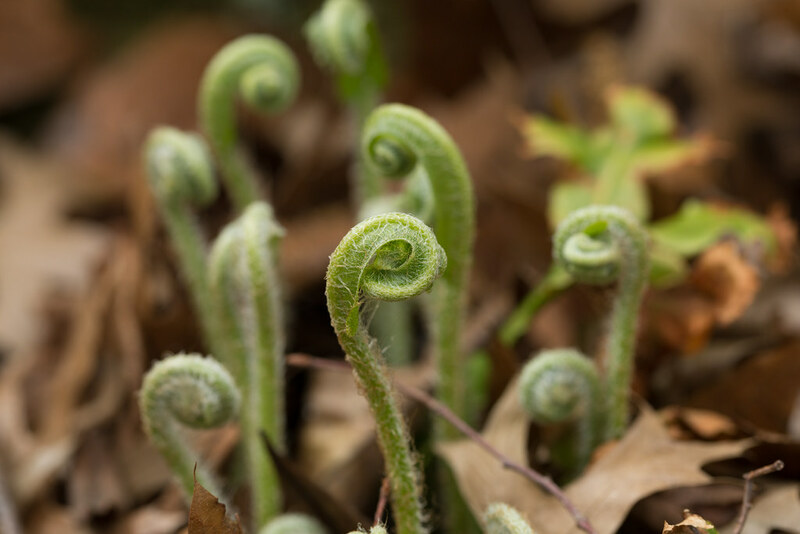 Due to the efforts of Dr. Ralph C. Benedict, beginning in the 1920s, Brooklyn Botanic Garden was the first public institution to work with American hart’s tongue fern in a conservation capacity. In his time, much of this plant’s habitat was being lost to industrial development. Dr. Benedict, BBG’s resident investigator and a passionate fern and native plant advocate, took it upon himself to collect spores and grow young ferns for the purpose of naturalizing them outside their original habitat so that the fern would not go extinct. Long before the Endangered Species Act was passed in 1973, botanists such as Dr. Benedict recognized the pressures faced by vulnerable plants. Beginning in 1925, he wrote a series of leaflets for the Garden calling for a two-pronged approach to save hart’s tongue fern. First, he wrote, sanctuaries had to be established where the ferns could grow free from manmade disturbances. Second, the New York State legislature needed to pass stronger protections for rare plants threatened with extinction. 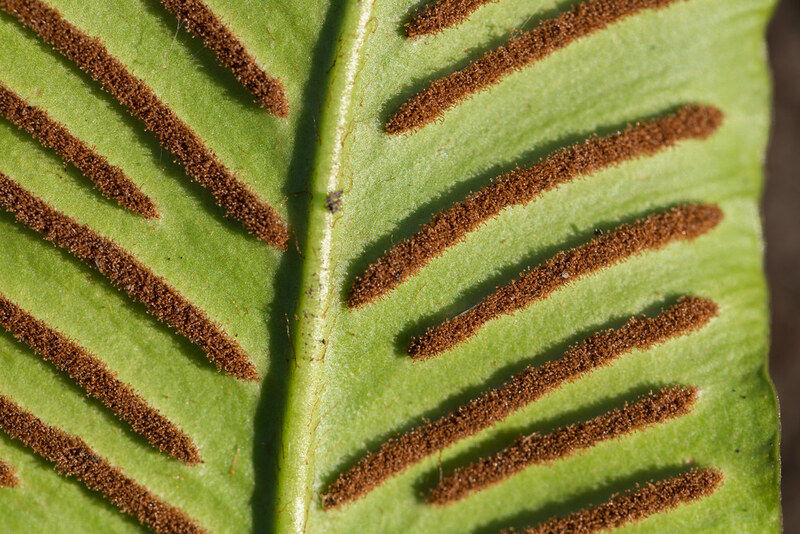 Thanks to ongoing conservation efforts, American hart’s tongue fern is still around. Today the plant is protected by state laws and is federally listed as endangered. But despite stronger legal protection, new challenges have emerged since the 1920s, in particular, climate change. Even though much of the land where the fern grows is protected, it requires cool, shaded limestone ravines, so it is especially vulnerable as the climate warms. BBG is now working with the U.S. Fish and Wildlife Service and SUNY’s College of Environmental Science and Forestry (ESF) to help protect American hart’s tongue fern. Those of us involved want to educate the public by displaying this plant in ex situ sanctuaries such as Brooklyn Botanic Garden. Like Dr. Benedict, we also recognize the need to foster its survival in its natural habitat. SUNY-ESF’s Dr. Danilo Fernando is working with the Fish and Wildlife Service to propagate specimens from spores and place young plants in the wild to augment existing populations. Dr. Fernando is also introducing the plant into new habitats within its historical range. Using DNA comparisons, he has been able to distinguish the American variety from the widely available European variety, which is often sold in the horticultural trade as American hart’s tongue fern. Native plant research like Dr. Fernando’s is important for preserving the genetic diversity of rare plant populations and helps guide recovery efforts. 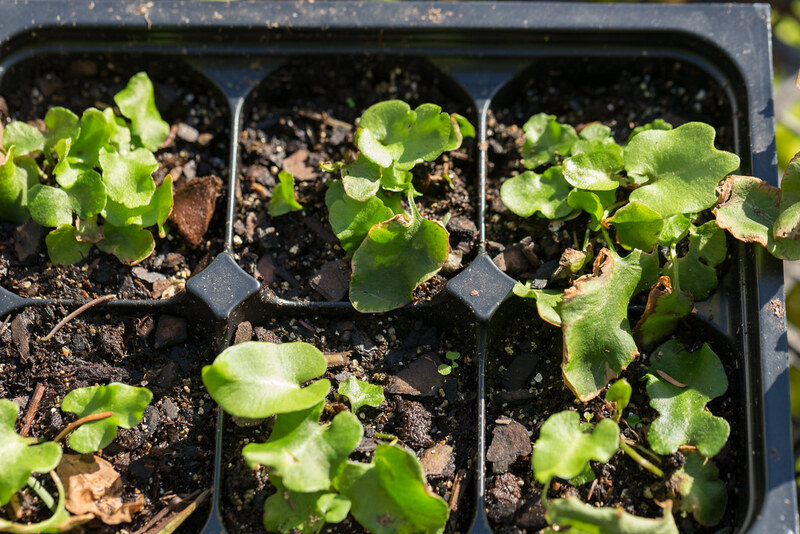 Dr. Fernando recently gave some young fern plants to Brooklyn Botanic Garden. I am caring for them in our nursery and hope to plant them in the Native Flora Garden in spring 2018 so that visitors can see this very rare species up close. These ferns are a tangible connection to our natural heritage and represent the importance of preserving biodiversity. The Native Flora Garden is also a great place to observe a variety of other rare, threatened, and endangered plants. Public engagement is essential to saving threatened species. And the success of this effort is a testament to the collaborative spirit between federal, state, and academic partners. For more information about this project, please check out the U.S. Fish and Wildlife Service blog post. 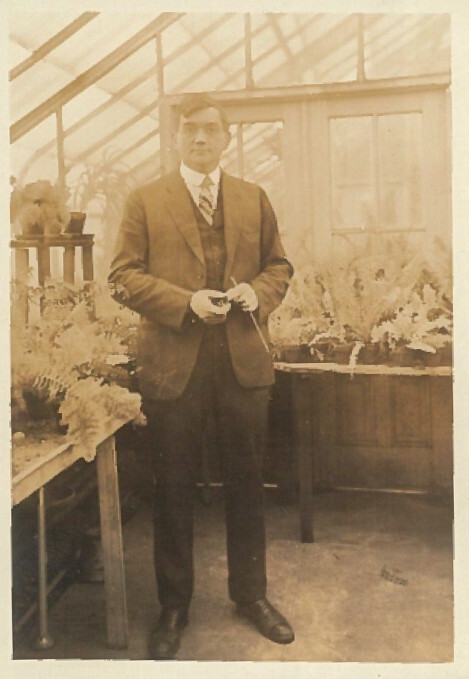 Ralph C. Benedict, Brooklyn Botanic Garden’s resident investigator, in the 1920s. Fiddleheads of hart’s tongue fern (Asplenium scolopendrium var. scolopendrium) in the Native Flora Garden. Genetic testing has revealed these plants to be the European variety. Photo by Uli Lorimer. The underside of a hart’s tongue fern frond (Asplenium scolopendrium var. scolopendrium), with spores. Photo by Uli Lorimer. Young specimens of American hart’s tongue fern (Asplenium scolopendrium var. americanum) in Brooklyn Botanic Garden’s nursery. Some will be ready to plant in the Native Flora Garden in 2018. Photo by Uli Lorimer. 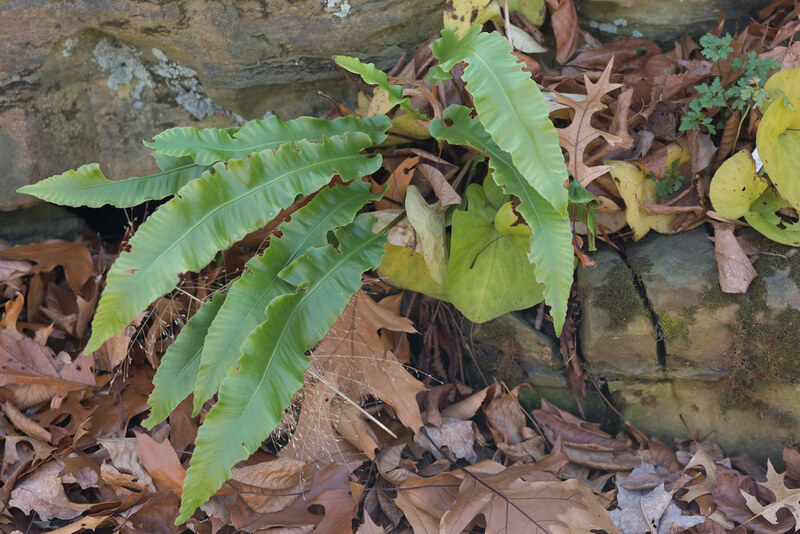 Mature hart’s tongue fern (Asplenium scolopendrium var. scolopendrium) in the Native Flora Garden. Photo by Uli Lorimer. 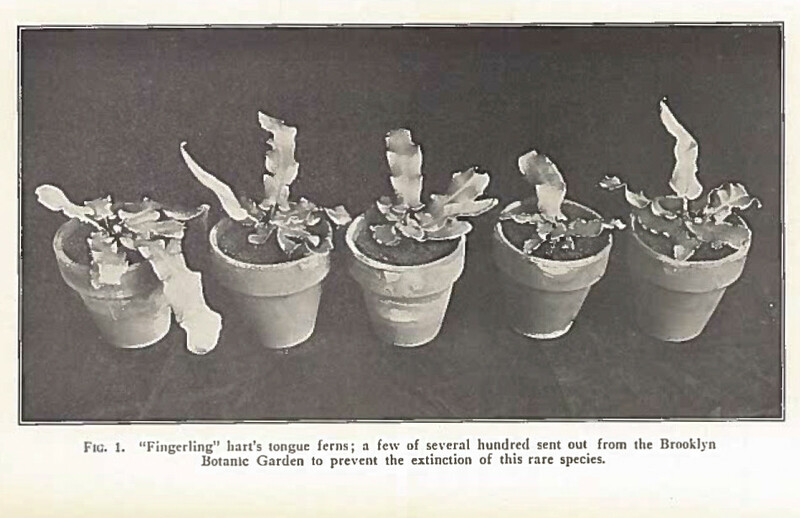 A photo of hart's tongue fern specimens from a leaflet series written by Ralph C. Benedict, Brooklyn Botanic Garden’s resident investigator, in the 1920s.